BPO hires independent contractors as remote technical support agents and customer service reps to service its clients. Pay is a per-minute rate that goes as high as $10/hour. The program of this financial services company employs home-based call center agents with experience in reservation systems for its corporate travel division. Bilingual agents needed. Apple At Home, the remote call center program from Apple, employs both college students and non-students for full- and part-time positions. Apple provides a computer and phone. This company's home-based employees work in customer service, sales and business telemarketing as well as insurance auditors and LPNs and RNs doing telehealth work. See more work-at-home insurance jobs and sales jobs from home. Call center for device replacement insurance (formerly NEW Corp) hires home-based employees for full-time and part-time customer service work. Part-time and full-time virtual call center agents employed by Convergys receive incoming calls and provide services that may include customer service, sales or technical support. Paid training and benefits are available. Car rental firm employs full-time reservation agents who work from home in the Atlanta metro area. Pay is $12-14 per hour. French- and Spanish-speaking agents are needed. Company hires agents, including licensed insurance agents, for a variety of call center jobs for its clients including outbound sales, bilingual customer service (Spanish and French) and financial services. Agents are paid at a rate that is based on minutes of talk time plus sales incentives in some cases. Agents must become "certified" to work for individual clients. This certification is not paid. Company provides remote technological support to clients, via home-based tech support chat and call center agents. Its remote services technicians answer inbound calls and its solutions center supervisors support and supervise the remote services technicians. Home-based agents, who are employees, not contractors, receive inbound customer service and sales calls for a variety of this BPO's clients. They are paid for training and once started to receive $9/hour. Applicants who are offered a position must pay $45 for a background check. The hiring process for these call center jobs is online and by phone. Bilingual skills a plus; languages include Spanish, Mandarin and Cantonese. Global business process outsourcing (BPO) company employs associates In some U.S. states and the U.K. to work from home as call agents and other fields. Benefits include paid training, 401k. Pay is $9-10/hour. Global call center company hires home-based customer service and tech support agents in Georgia. Independent contractor,work-at-home call center agents use a predictive dialer system to make verification calls for company's clients, which are primarily from the newspaper industry. Chicago-based call center firm employs home-based reps for telemarketing positions. Work-at-home call center agents, who are independent contractors, handle a variety of calls including technical support, sales, travel and ticketing, and customer service. There are also some work-at-home data entry and editing jobs. 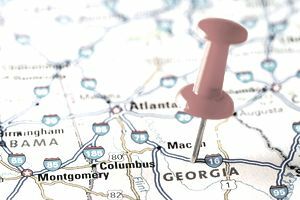 There may be more companies on this list of call center companies that hire agents from Georgia.